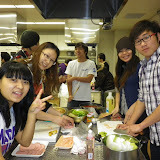 We had a cooking party on 20th Jan. We organized 6 teams with members of Chinese,Vietnamese,France,Russian and Korea. We enjoyed and the dish was very nice! !